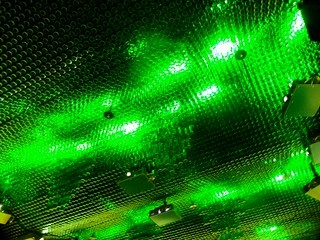 A morning in Haarlem, an evening in Heineken — Jessica Bodford, Ph.D. 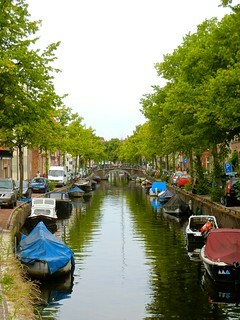 Originally, we’d planned on spending four days in Amsterdam and one day in Bruges, Belgium. After realizing how much it would cost (in both time and, more importantly for grad students, money) to get to Bruge, we abandoned that idea for a substitute medieval town only 45 minutes from Amsterdam: Haarlem. Note: if your first thought was Harlem, the New York City borough, you're not far off: America's Harlem was once called Nieuw Haarlem (New Harlem), named after this medieval Dutch town. New York was originally called New Amsterdam, and was primarily a Dutch colony before being seized by the English, who renamed it in honor of the Duke of York. There are many other similarities, including Greenwich Village (present in both), Manhattan (present in both), 't Lange Eiland (Long Island), de Brede Weg (Broadway), Heemstede (Hempstead), Konijneneiland (means "rabbits island", translated Coney Island), Kromme Zee ("crooked lake", now Gramercy), Staten Land (Staten Island), and even Walstraat (Wall Street). Although it was nothing like what we knew about Bruges, we had a good time exploring the town for a few hours that morning, albeit under the first overcast skies I’d seen since my first few days in Reims almost three weeks before. 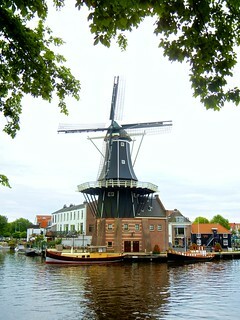 We started with one of the most cliched scenes you would expect from Holland, sans the rows of multicolored tulips: the Molen de Adriaan, a working windmill on the outskirts of the town. 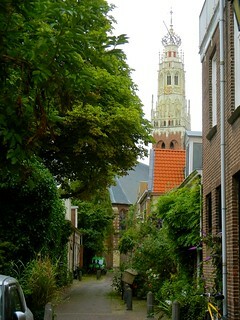 We strolled through Amsterdamse Poort (ca. 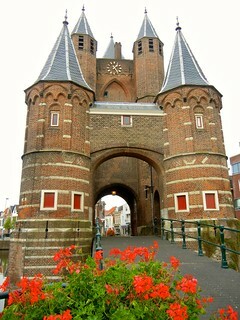 1274), which was the original city gate complete with a picturesque moat for extra protection. Teylers Hofje offered a pretty view of a plant-ridden courtyard and the distant towers of the Grote Sint-Bavokerk (St. Bavo’s Church, ca. 1400). 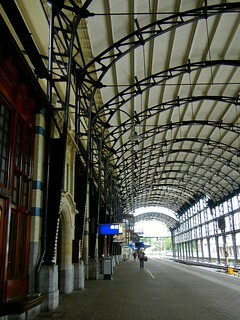 Grote Markt was next on our list: a former meat (vleeshal) and fish market (verweyhal), now used as a central town square. The stadhuis, or Town Hall, opens off of Grote Markt, and looming far overhead was the grandiose gothic St. Bavo. 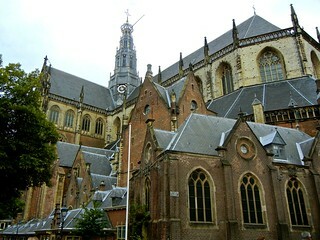 Although its interior looks strikingly similar to the Old and New Churches of Amsterdam, St. Bavo is a particular beauty with its 165-foot steeple and 5,000-pipe Müller Organ. This organ, which is considered one of the most magnificent in the world, has been played by the likes of Handel and a 10-year-old Mozart. And unsurprisingly, we visited toward the tail end of an international organ festival, which was a cool sight. 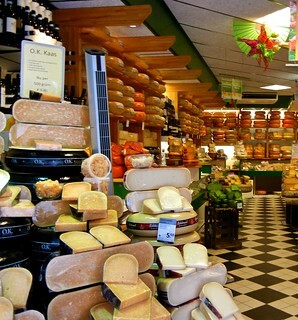 Last, we swung by Kaashuis Tromp (Tromp cheese house), one of the most famous cheese shops in the country that is based in Haarlem, and picked up blocks of cheese we couldn’t pronounce. We grabbed loaves of bread from a nearby bakery and sat in the middle of Grote Markt, eating our spoils until we never wanted to see cheese again. We got back to Amsterdam just after lunch and headed immediately for the Rijksmuseum, a famous art museum in the Museumplein district. And as our 21st museum, the last thing I wanted to see was a towering palace of a building, roughly the same size as the Musée d’Orsay. If my feet could talk, they would’ve been screaming. We hobbled through the museum at the speed of tortoises, sitting on every bench we passed and feigning fascination with whatever work of art sat immediately in front of us. The part that stands out most in my mind was a library that would have put the Beast’s (i.e., from Beauty and the Beast) to shame. I never wanted to leave…and no, not because I’d found a bench there. To our defense, we covered almost every inch of that place -- all four floors, and almost every hall within. Ryan grabbed an informative museum guide separated by century that we’ve been looking through ever since when we’ve had a moment, which slightly quenches our guilt at not enjoying the place as much as we might have a week before. I do, however, want to make a skeptical note about artwork in general: Social psychological research has so often looked at social influence in naturalistic settings when it comes to, say, crossing streets. If ten people are standing on a street corner and one strides confidently into the road, chances are, the other nine will follow blindly without bothering to look in either direction. And speaking of crossing streets, if I make it through these last several days in England alive, it will be a miracle. I was overjoyed to see that London has painted ten-foot-long “LOOK RIGHT” and “LOOK LEFT” warnings on every street crossing, possibly to cover their own butts when tourists are run over by raging double-decker buses. I’ve seen the same form of social influence in every art museum we’ve visited: If several people are standing in front of a work and simply gazing in quiet reverence, many, many more will follow suit, as if they think they’re missing some sort of underground masterpiece. When we strode into a room that held Rembrandt’s massive The Night Watch, at least 50 people were staring, pointing, and completely oblivious to the fact that half of their peers were part of a guided tour that just so happened to stop in front of it. Unfortunately for me, mademoiselle skeptical social psychologist, I muttered “What’s so special about it?” in a voice just loud enough for a guard to hear, which earned me a particularly acute death glare. That evening marked the most traditional Dutch meal we had in Amsterdam, which was also my favorite meal of all: Our AirBnB host directed us to the Restaurant ’t Zwaantje (the Swan), a dark pub that might have been pulled straight from a small village in Ireland. We enjoyed a beef stew that exploded with flavors, along with mash, Brussels sprouts, carrots, cabbage, and a few unknown vegetables, all sprinkled lightly with cinnamon to cut the spice of the stew. Our last stop for the night was the famous Het Concert-gebouw, where we saw Bruut! -- a jazz group -- as part of their Robeco Summer Nights. 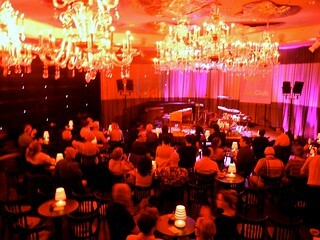 The show was excellent, and the venue intimate: a round, black-box theatre with small tables, candles, and free wine. Side note about seeing concerts in Amsterdam: Although English is spoken almost equally, Dutch is the chosen language among all locals. It reminds me of Japan, where Kanji characters are used for advertisements and commercial purposes -- in this case, English is used in professional settings, and Dutch elsewhere. So when performers take a break to chat with the crowd, chances are, it will be in Dutch. And it took us less than 30 seconds to realize that when the crowd laughed jovially, we should laugh, too. By the end, we were cracking up with our neighboring tables without having a clue of what was being said. If this sounds funny, it was ten times funnier in person. By the end, I was simply laughing at the fact that I was laughing at jokes I didn’t understand. 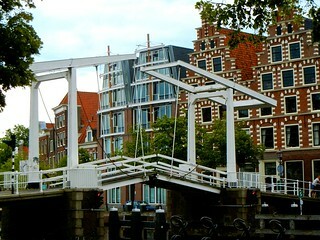 In Amsterdam, the Louvre of Paris is the Anne Frank House. This house was her father’s jam factory and her family’s ultimate hiding place -- secret staircase door and all -- in the years before their capture. Over the course of our previous four days in Amsterdam, we’d passed by many a time while on our way to Yan’s apartment…and with every passing, we’d look at each other and laugh at the sheer length of the lines stretching from the front stoop along the side of the building to the next canal, around the corner and to a distant bridge, around another corner and back town toward Prinsengracht. And at 8:30 the next morning, this was precisely the line we joined. Even though we arrived half an hour before it opened, we stood in line for more than an hour and a half before we even made it into the building. And even though we’d heard that the museum was overrated, we were pleasantly surprised at its size and depth of information. Out of the eight in hiding, Otto Frank was the only survivor. He returned to that very house, hoping to find his daughters there, and instead received Anne’s many notebooks and writings. After a few years, he published them in Amsterdam; several years later, he opened his factory and home as a museum in remembrance of the violence of the Holocaust. 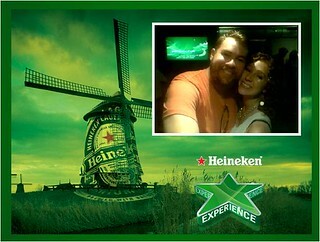 We really enjoyed the experience, and it was well worth the wait. Although the museum wasn’t as interactive as many we’d seen, it was carefully and tastefully done, considering the seriousness of its subject matter. Thanks to Taylor’s recommendation, we had lunch at the Upstairs Pannenkoekenhuis (pancake house), the smallest restaurant in Europe. It boasts only four tables and one griddle, and is squeezed on a street that feels closer to an alley than an actual thoroughfare. We split a salami-cheese and a bacon-apple pancake (the apples had a sprinkling of cinnamon, which should remind Dad of Finch’s)…and yes, the Dutch add syrup tho these savory masterpieces. We’re only talking the lightest of drizzles, not even enough to see after a few seconds, but syrup in Amsterdam is also quite different from your average Aunt Jemima: it’s thicker, has more molasses, and is less sickeningly sweet. So if you’re cringing at the thought of an Elf-like reference to syrup- and chocolate-covered spaghetti, never fear -- it was actually delicious. 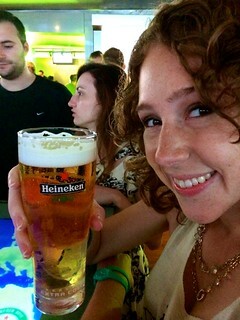 Our last stop in Amsterdam was the Heineken Experience brewery tour, and I have no shame in admitting that it was one of my favorite museums out of the 21 we’d seen. Heineken, which personally isn’t my jam, was one of the first breweries to take a scientific approach to brewing beer: The director appointed in the early 1900s was a chemist, and formed laboratories, set up bottom fermentation methods, and used new strains of yeast to achieve the perfect beer. The tour was incredibly interactive, beginning with beer brewing “lessons”, tours of the equipment needed, and opportunities to stir and taste various stages of the process. They’ve also embraced technological advances to give guests many opportunities to play. Each tour provided a chance to learn how to pour and taste beer, as well as two glasses of Heineken and a souvenir glass to take home. And this brought us to the end of our time in Amsterdam, which I already miss. We spent the rainy afternoon packing and resting our feet, and were up at 4:00 the next morning to make our way to London. And of course, many things went wrong. Clearly the gods of transportation despise us. But for now, that story can wait until my snarkiness level reaches its minimum required threshold.